The first time I used a face scrub was when I was in high school. It was that dreadful St Ives Apricot Scrub - the gateway exfoliator, breaker of many capillaries, destroyer of porcelain complexions. I, like many others loved the way my skin felt after I first started using it. I couldn’t stop running my fingers over face, marvelling at it’s smoothness. But the thing with us humans (or me at least) is that when we have a good thing we tend to overuse and abuse it. So from using it once or twice a week I would use it three or four times. Looking back I now understand why my skin became so sensitive in my early 20s. It wasn’t was terrible, just that it would react to everything. My skin only became truly horrible when I started partying big time. Thankfully that phase is long over. But my fascination with exfoliation still remains. Fast forward a few years and I discovered the joys of chemical exfoliation. My first was DDF’s Glycolic Toning Complex. Oh how much that loved that product. I used it twice a day, morning and evening. Then my friend Druv introduced me to Peter Thomas Roth’s Max Complexion Correction Pads that contained both glycolic and salicylic acids. The former works on the skin’s surface while the latter goes deep into the pores to unclog them. I also tried Keracnyl cream, which contains a blend of super-gentle polyhydroxy acids that clear up skin like nothing else. And of course no exfoliation routine can be complete without the iconic Dr Dennis Gross Alpha Beta Peel Pads. During these days I loved my skin and my skin loved me - it didn’t breakout and stayed completely bump free. The problem began when I started using retinol each night with acids a few times a week. I slowly built resistance for more potent retinoids, because we all know they resurface the skin and stimulate collagen. But there’s certainly too much of a good thing. During that winter when I was on my retinol sojourn (a few years back), my skin became very dry and flakey. It would burn after a warm shower and felt extremely delicate - like my face would melt if I spent several hours in the sun. Then, during a trip to Berlin I was advised to use just a face cleanser (Julisis Silver Wash Night), with a drop of manuka oil. I was to clean my face with a take on the Erno Lazlo cleansing method, where you splash your face with hot (but not scalding) water to stimulate the skin. But then put nothing else afterwards. After a week or so feeling dry, the red spots peeled off leaving clear, healthy complexion underneath. I stuck to that ritual for a few months but being the skincare enthusiast that I am, I was soon back to my old ways, albeit with lesser intensity. I found that I could only exfoliate twice or thrice a week and use nothing else. But earlier this year I decided to try something new. After following several green beauty bloggers and experts I decided to forgo exfoliating altogether. I mean our skin sheds naturally once a month right? And the skin’s natural microbiome helps the exfoliation process. By using acids we make the environment unfriendly for these friendly little critters, because of which I skin can’t naturally shed itself. It all made so much sense. It helped that I had a couple of amazing green products from Julisis that really made my face glow. But what I completely forgot that I’m also on two kinds of synthetic hormones for my endometriosis. So no, my skin does not function naturally. Over the last few months I’ve tolerated feeling positively reptilian in the hope that at some point my natural exfoliation process would break through. But unfortunately that didn’t happen. What I got was increasingly clogged pores. Finally I reached the end of my patience and decided to begin exfoliating again. I started with a Biologique Recherche facial in Europe and then succumbed to their Lotion P50, the ultimate exfoliator, also called ‘Jesus in a bottle’. The lotion contains lactic and polyhydroxy acids (great for sensitive skin) along with salicylic acid. After washing my face I use this first and then pat on the Biologique Recherche Serum Iribiol only on blocked pores or breakouts. This is the quickest acting product in shrinking spots and that too without drying the skin. It literally is like water and can be layered under any other serum. I’m hooked. 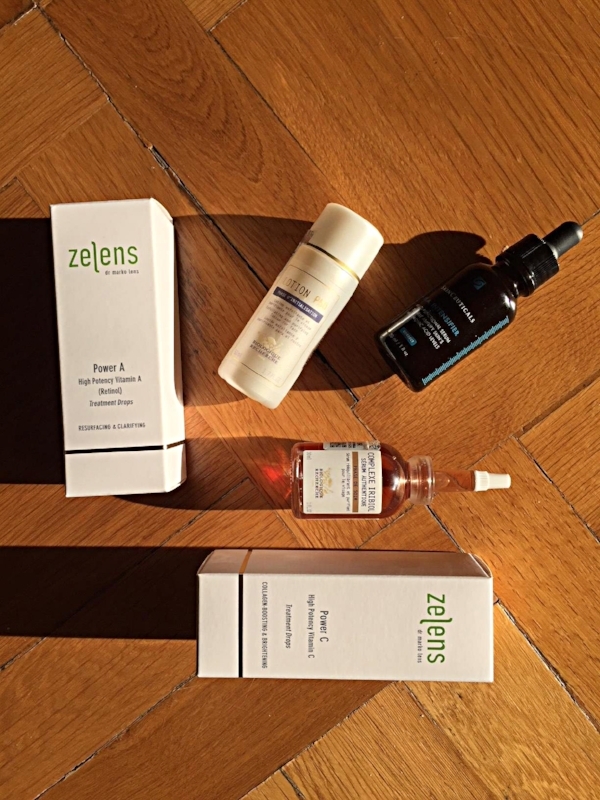 I’ve also ordered Zelens Power A (with three types of retinols) and Zelens Power C (with 20% vitamin C). But I use these products mindfully and because they are such potent concentrations, I use them at night after Serum Iribiol. The Power A is twice a week at night and Power C five times a week. I use the Lotion P50 (without phenol) only when I’m using vitamin C. However I never use retinols and acids together. While I like the idea of me using only green products I find that I need to mix them with a good exfoliation routine so they work better. I still use the Julisis Gold Emulsion in the day as a moisturiser but I don’t see myself investing in it again. I’ve also got the Skinceuticals HA Accelerator, which is an amazing hyaluronic acid serum that I use in the day. I use the Serum Iribiol and then mist my face with Avene’s thermal water. I pat the HA serum on damp skin so the hyaluronic acid just absorbs the water and swells up. It makes my skin look plump and glowing in just a single use. I eat clean, meditate and do yoga, but when it comes to my skin, I find that I prefer proven actives like vitamin C, A, hyaluronic acid and chemical exfoliants. But I’m trying to use them carefully this time around. So far my clogged pores have reduced by 80% and my skin is back to looking as clear as it used to be. If that isn’t worth it then I don’t know what is.